I waffled and fence sat for many months about selling my Kromski Minstrel. 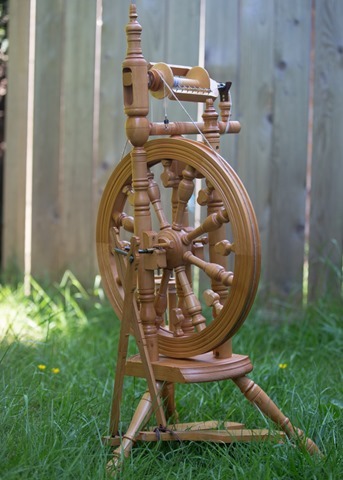 It is a fantastic wheel, served me very well and will continue to be a wonderful wheel for its new owner. I don’t have room to store two castle wheels in our home so the tough decision had to be made to let one go. 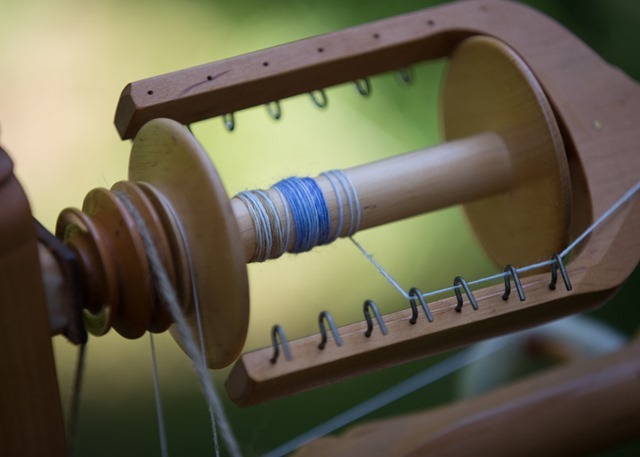 While I was oiling it, wiping it down and spinning a little bit on it, I was reminded of the many hours I spent spinning away in the past few years. 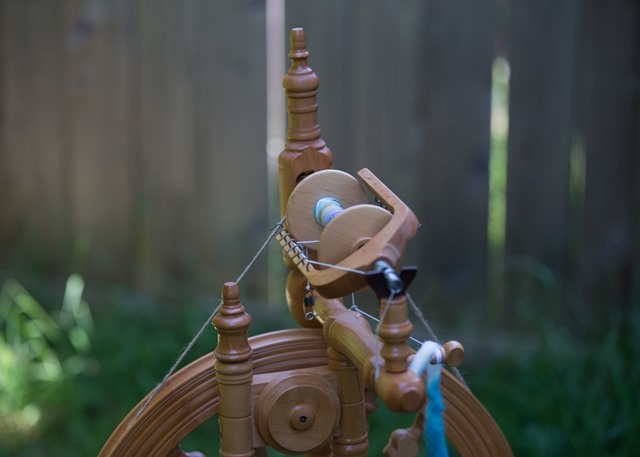 I have created some gorgeous yarn on it – many of which are still in my stash and will now always hold a special place in my heart because they were spun on this particular wheel. 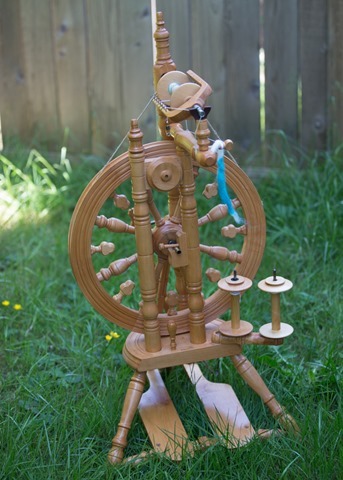 While I was waffling about whether to post this For Sale or not, I was struck by this odd sensation that we spinners have about our tools (and most crafters for that matter). 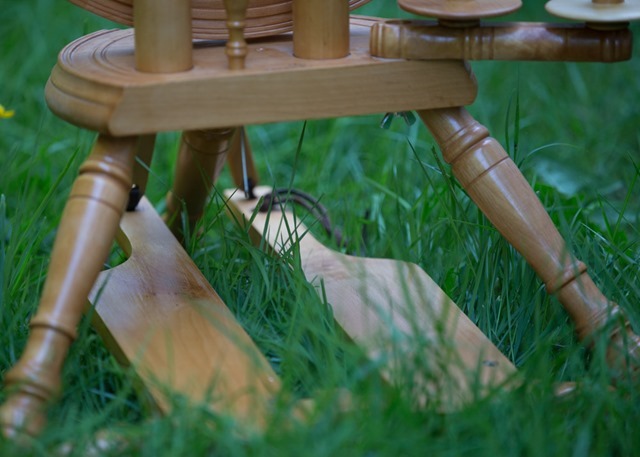 We seem to place a lot of value on our tools, be they fibre prep tools, wheels, spindles or any other number of things. I found myself wondering why this is? I think it is the pride we take in the work we do to create and make. I spent many evenings enjoying this wheel, maintaining it and sometimes, fighting with it. Lets face it, we don’t always get along with our tools! A common thread between many of my crafting friends is a deep commitment to looking after and maintaining our tools. Keeping knitting needles in cases, away from anything that may harm them (be it corrosion, breaking from little hands or any other number of noxious things). 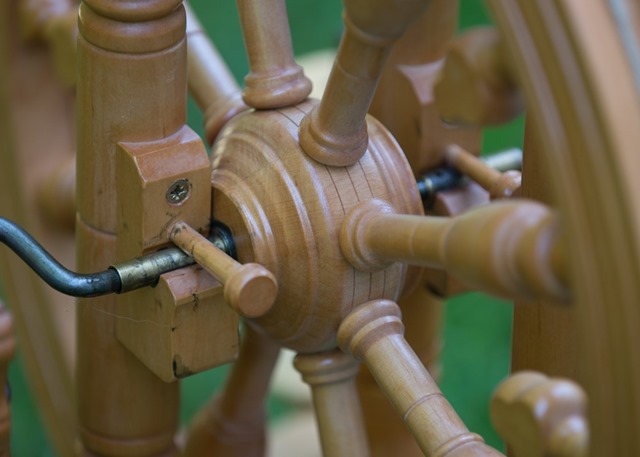 Keeping spinning wheels well oiled, dust free and clean, and operating. Spindles placed in appropriate cases (even if they are shoeboxes) to prevent any damage. Hand cards, combs and other fibre prep tools stored well to prevent both damage to and by the tools. Remember, combs can be especially dangerous for little ones! Some of the things I will miss about my Minstrel include the on-board Lazy Kate. 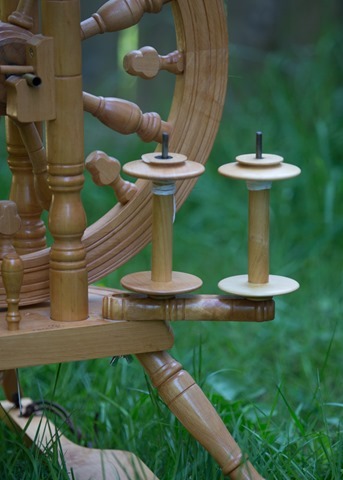 I liked being able to store bobbins, both empty and full, on the wheel as I was working on projects. It was also great to ply off of in a pinch. I liked the look of the Maiden. The flyer was the ‘plainest’ part of the wheel but everything else about this wheel was lovely to look at! I loved the leather ties on the treadles. There’s just something about leather that really makes this wheel – it looks traditional and contemporary all at the same time. A small tribute to my first wheel – I hope you didn’t mind!